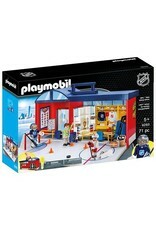 NHL Take Along Arena 9293 - Grow Children's Boutique Ltd. It's game night at the NHL Take Along Arena! Designed in a convenient take-along case, this set is perfect for on-the-go fun. Simply fold down the front panel to reveal an exciting hockey game. Players can get ready for the game in the locker room area, which also provides room to store all your hockey gear. Once the player hits the ice, bring the action to life by simply pulling back the player's lever to move the hockey stick and fire the puck across the rink. Then, maneuver the goalie in the net to block the shot. On the sidelines, the coach calls our game plays and guides the team through the match. Use the included number stickers to customize your players' numbers. 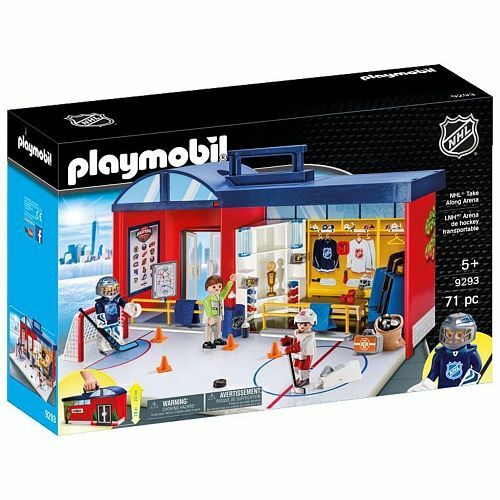 Set includes three figures, arena structure, goal net, side bench, railings, First Aid kit, play strategies, jersey numbers, hockey sticks, pucks, dumbbells, and tons of other hockey accessories. Recommended for ages five years and up. NHL and the NHL Shield are registered trademarks of the National Hockey League. All NHL logos and marks and NHL team logos and marks depicted herein are the property of the NHL and the respective teams and may not be reproduced without the prior written consent of NHL Enterprises, L.P. © NHL 2017. All Rights Reserved.